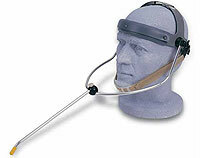 The following list details a number of different styles of head, mouth and eye operated controllers. Most of these are for PCs and Apple computers, but there are alternatives for games consoles too. Some of these devices are very expensive, so it is always worth trying to track down some way of trying before you buy. Please feel free to e-mail for help on anything that is unclear, and to offer any new accessible gaming discoveries. There are a number of devices available in this field. 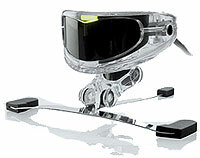 The simplest to set-up are the Neurosky range of headsets. 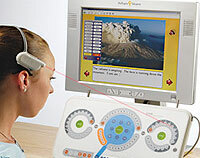 See Myndplay for the most comfortable Neurosky based headset. Less convenient to set up and learn, but more sensitive are the Emotiv headsets. Camera Mouse is a free program that allows you to control the mouse pointer on a Windows computer just by moving your head. Clicking can be done by making the mouse pointer dwell over a spot on the screen. From Tobii (e.g. Eye Tracker 4C) & others. 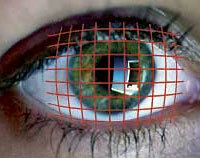 Gaze Point free Tobii eye to mouse pointer software. Project Iris to convert on-screen areas to key-presses. 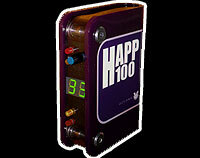 The Celtic Magic Huff And Puff Processor 100 (HAPP100) is an advanced breath operated PC controller. This device allows for fine control over a mouse to control a PC. 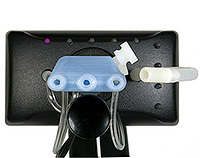 Chin switch; SCATIR switch (for very small movements); Sound operated switch; Piezo switches (for very small movements); Sensa Switch; Sip-puff switches. 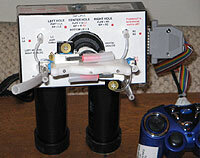 For more on switches and mounting systems, see the Switch section. 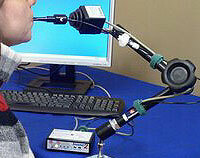 Also consider chin mounted joysticks. A very easy to set-up head-tracker for PCs and Macs with an excellent mounting system and switch access. A low-tech solution, although this one is quite pricey. Also known as a head wand. Another expensive but high-quality looking mouth controller for PCs and Macs. See this SpecialEffect video for info on Xbox 360 and PS3 compatibility. An expensive but high-quality looking mouth controller for PCs and Macs. Has the facility to enter text via sip-puff morse-code! Windows PC Kinect based software that can translate a wide range of head-movements, facial expressions, and blinks to key, mouse and/or joystick events. Requires a Windows Kinect controller. The SmartNAV 3 tracks a silver-dot that can be placed on the forehead, a pair of glasses, or a hat. This movement is then transferred to the mouse pointer. PC only. 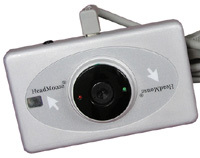 It can be used with external switches, voice clicking or the supplied dwell clicker. It can also be used with Track Mapper to make this compatible with many keyboard accessible games. 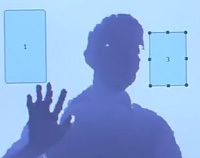 An incredibly sensitive Kinect based switch system for Windows PCs. 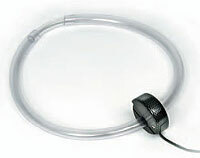 Another fairly pricey but professional device for mouth control of a PCs and Macs. Use the in-built sip/puff control to trigger mouse clicks. The spiritual successor to Ken Yankelevitz's Quad Controller. For Android, PC, PS3 and other machines via adapters. A versatile and cheaply priced head-controller for USB equipped PCs and Macs. 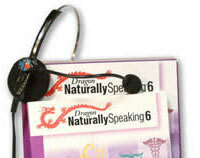 This unit can be adapted for use with the tongue too. 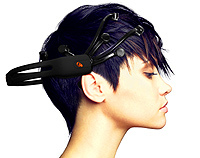 See the TetraMouse comparison page for more on this device, as well as many other head controlled devices. Can aid with some games requiring typed or spoken instructions. Can also aid dyslexic gamers. PC and Mac. See also GlovePie and Vocola and DWVAC.com (Voice Activated Commands) and Dragon Gaming. 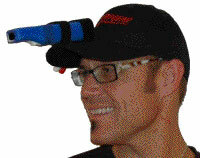 Head mounted Wii-remote with switch accessible adaptation. Software utilities for PCs and Macs to aid head-gaming. 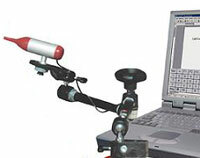 An unusual light activated controller using a laser and specialised keyboard for PCs. 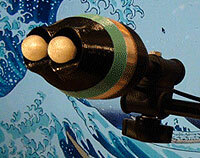 A fully compatible sip and puff controller for the Playstation 2, Xbox, Xbox360 and other machines using adapters. See also QuadStick. Ability Net - is a UK charity helping disabled adults and children use computers and the internet by adapting and adjusting their technology. Ace Centre - have a great guide to alternative mouse pointers, including web-cam and ultra-sonic based interfaces. Axistive - Useful links to Sip and Puff products and information. COGAIN.org - Communication by Gaze Interaction. 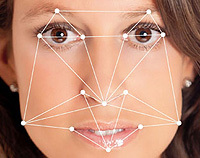 Much useful information for eye-tracker users. Game-Accessibility - Focusing on the accessibility of electronic games for gamers with disabilities. 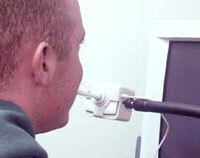 See the Head-Tracker Games forum for compatible video games. Simmunity - Have created a tongue-pointer controlled Game Boy Advance in the past, and may be able to take on new related projects.